Petplan US has an interesting story. In 2001, Natasha and Chris Ashton, moved to Philadelphia with their cat, Bodey to attend the prestigious University of Pennsylvania’s Wharton School of Business. Shortly thereafter, their cat became ill and the veterinary bill ended being $5000.00 This unfortunate incident with their cat and the knowledge that nearly a quarter of pets are insured in their native Britain gave them an idea to enter their school’s business plan competition, and submitted a pet insurance business plan called PAWS, which won the $20,000 grand prize. Thereafter, the Ashtons incorporated Fetch Inc., which in November 2003 was awarded the exclusive license for the Petplan brand in the United States, which had its start in the U.K. in 1976. So if you combine Petplan’s history in the U.K., Petplan USA, compared to its competitors, has been around the longest. In 2011, Petplan was selected by North Shore Animal League America, the world’s largest no kill animal rescue and adoption, as their exclusive insurance provider. Every new enrollee is offered a month of Barkbox, a pet treat company headquartered in NY, and a subscription to Fetch magazine. Enrollment Requirements No exam required prior to enroll. However, you need an exam prior to claims payout. Yearly exam required for future claims payout. Get your paws on a fast, free quote now at Petplan.com! 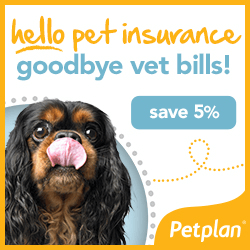 Get an automatic 5% discount on your dog’s health insurance just for enrolling online at Petplan.com! Offers Long established history. Petplan UK founded in 1976. Excellent customer satisfaction reviews with pet insurance review (9.1), and consumers advocate (8.9/10). Requires pet owners to take pet to vet within 48 hours of noticing symptoms. Does not allow policy holders to change/add plan until the next 12 months’ period begins. Does not cover other injured knee if first knee was pre existing prior to enrollment. Although Petplan monthly premium is higher than most of its competitors, Petplan offers one of the most comprehensive insurance plans, with many options for annual benefits, deductibles, and reimbursement rates. In addition, Petplan offers vet exams fees, no upper age limits, and 24/7 customer service. Although not a dealbreaker, Petplan requires pet owners to take their pet to the vet every year for a health or dental exam, or anything diagnosed at the next visit may be treated as a preexisting condition. So if you file a claim for an ear infection, and the pet has not seen a vet within the last 12 months, that ear infection may not be covered. Petplan’s advantage over the other pet insurance companies is that it has been in business for 40 years (U.K. included), and a long established reputation. 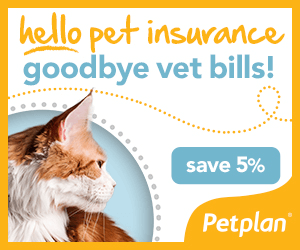 So if you are looking for a pet insurance company that offers one of the most comprehensive insurance plans, offers 24/7 customer service, and has the longest established history and reputation, click on banner below and see if Petplan’s plans and prices would be a great fit for you and your pet.